Ask six-year-old me what my favorite meat was, and I'd likely have told you, "Pork fat." Seven-year-old me would have inhaled deeply before gasping, "BEAR!" At least I was consistent; bear is much like pork, only deeper and smokier and spicier (yes, "gamier"). Like bacon would be if pigs ate blueberries. H. Rose found a fresh bear, minus the choicest morsels, and hauled it home on HAC's horse. She roasted us the ribs. In the meantime, I butchered and roasted up one dangerous specimen of a parsnip Mama pulled from the frozen garden, and sloshed maple syrup all over it with a heavy hand before I turned the oven off and let it wait till suppertime. 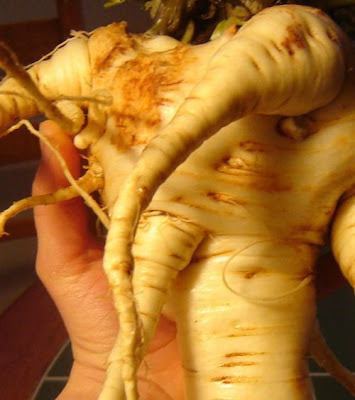 Ordinarily I preach the superiority of small vegetables, but a good frost sweetens and tames even a behemoth of a parsnip, especially if it already has the advantages of a good garden upbringing. Small produce is always preferable when "large" is achieved through genetic modification and hyperfertility, yielding mealy bland bitter waterlogged monstrosities. (Remember: always pick the littlest apple or chalice or princess). But certain beasts do achieve magnificently large-scale flavor, like that feral parsnip and its cousin, the wild bear. nice look. who's doing your photoshopping? Thanks! It was a Christmas present from this fella I met who, incidentally, makes the best waffles ever. I'm diggin' the new look! Hey! I like the new page layout. Very sophisticated. I guess the next step is to have your own cooking show on cable t.v. They use cables for what? transmittin' movin' pictures. . . . .